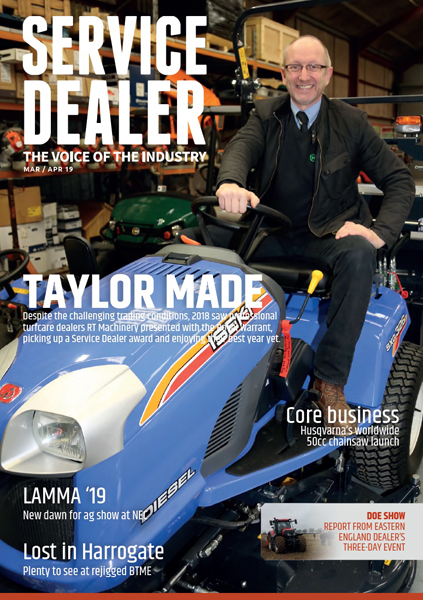 SERVICE DEALER is the UK's leading business magazine for garden machinery, professional turfcare, farm machinery and outdoor power equipment sales and service dealers, manufacturers and suppliers . Sent FREE-OF-CHARGE to Bona-Fide sales and service dealers and suppliers serving the garden machinery, farm machinery, professional turfcare, ATV/QUAD, forestry and outdoor power equipment markets in the UK. To register to receive Service Dealer magazine (6 issues a year) and the weekly Service Dealer Weekly Update, published every Friday lunchtime, please complete this form.